Somehow I was fortunate enough to be selected to be chosen for the honor of writing up a review for the new Badger Patriot 105 airbrush (no small bit to chew off). This airbrush was sent to the folks at Armorama by the very kind and generous proprietors at Badger for this review (Thank you!). While I am not the worlds foremost expert on airbrushing I have some experience and can get mine to work pretty well, despite its age. But the Patriot 105 is something new and a bit different for me. The Badger Patriot 105 is a sleek modern design with a large gravity feed reserve cup mounted just forward of the trigger. The rear portion of the airbrush has the “easy access” locking nut to extract the needle for quick changes or quick cleanings when needed. This is no minor feature, mind you. This is a very handy feature that some will find essential after having used it once or twice. Trust me. Need to change your needle from larger to super fine? No worries, just unscrew the nut, extract the needle, and insert the new one and you are off to the races. (That took like 60 seconds? I’ve seen guys take longer to change magazines in combat-I didn’t say they were smart guys mind you. . . ) The whole rear of the air brush unscrews rather easily allowing you to easily access the “guts” of the airbrush for cleaning and maintenance, which I am confident that this airbrush will need little of. The Patriot 105 feels substantial but lightweight in the hand and is comfortable to hold, for me. In fact, the only issue I have with the feel of it, is the trigger. The trigger top is smooth with a slight round depression in the center. My finger slides off this too easily. I would prefer a grooved top or rubber/silicone pad that would help prevent my finger from sliding. Just my two cents and maybe it’s only me. . . . The action on the airbrush seems very smooth, initially. I keep saying things like initially as I plan on putting this brush through its paces to see what it really does under “normal” and difficult workloads. I mean, if you’re going to shell out a C note for a new brush, ESPECIALLY for a newbie, you want to make sure you are getting into something that is right for you and will last, don’t you agree? The one thing I did notice is that the needle protrudes from the nozzle end a bit and let’s face it, I am not the most careful person. I could see the needle tip getting dinged accidentally. A cover of some sort would be nice for those of us that are spatially challenged, if you know what I mean. So in all honesty this airbrush came to me a few months ago and I had to shelve the review in order to take care of moving my actual business, no small feat BTW. So while it has taken time to write this all down, I have been taking notes when I can and making them mentally when I cannot (I’m mental!). But using the airbrush continually over the past few months for many applications I have been better able to access its full range and ability. I am going to write below what my experiences were for each use and how I feel the airbrush performed for each individual task and then give you a round up at the end of the review. My suggestion to the reader is to do your homework, read this and any other review you can find and make your decision on what seems best for YOU and YOUR needs. It is always best to do ones research for one’s self, trust me on this. So I have been using a Paasche H for a number of years and only recently realized that a single action just has some limitations that cannot be overcome. So I upgraded to a VL, which is nice but I have found that my VL needs a LOT of TLC and constant cleaning. Using different mediums in your brush can quickly lead to some difficult issues and so it has been with the VL. When I received the Patriot I was interested to see if my old prejudices about Badger were warranted or not. I began by doing some basic large scale painting with Tamiya acrylics. Tamiya paints are notorious for clogging brushes. The paint is thick and dries quickly, unless thinned really well, you are likely to get some sticking and splatter. I found that the Patriot handled the Tamiya paints really well and generally had no issues with clogging. I did notice that if I did not thin the Tamiya really well and or my pressure got too low that the Patriot would stick and clog. This was usually resolved by dipping the needle into some thinner or increasing the pressure back up to around 18PSI or so from down near 10. The only time it did act up on me was when I was doing some black camo on a Land Rover Ambulance. The gun clogged and then spit and I ended up with a splatter spot on my camo. Not a huge deal and I probably should have thinned my paint mix more. But the idea of any air brush not EVER clogging is just a fallacy, Teflon coating or not. So for the past few months I have been shooting both large and small jobs with the brush and have to say that I am very impressed with how the brush handled each medium and job. Large areas were easy to cover and did not even need to “open her up” as much as I thought I would. Coverage even at a distance was good with a fairly controlled area. What I have been really impressed with is the coverage on small items. Once you get a feel for the trigger the control of both paint and air is really nice. I have been able to shoot really small areas with great control. The only time I have found any issue is when I am lining up where I want the paint to go, now if this thing had a sight on it. . . .
What most people want to see in an air brush review is how fine the brush can get a line and so I will give this info soon enough and with pictures too. What I really wanted to do with this review was show that this brush could or could not handle all that I threw at it. So here are the results. When thinned well 30% paints flowed easily and depending on the distance dried quickly or slowly. More hang time between brush and kit results in shorter drying times. When thinned less clogs can happen but are easily resolved by hitting the tip with some thinner. Overall, good with Tamiya paints and I have been happy with these results. This seems to be THE item that fouls up all of my brushes, especially my VL. While the primer seems thin and flows nicely the chemical makeup of it tends to dry hard and sticky and is usually difficult to remove from any brush. Some iso through the brush helped but it still needed to be stripped and cleaned after running a few passes of primer through it. A bit of acetone removed any excess on the needle and a pass through the sonic cleaner with some iso took care of the rest of the parts. Again, the whole deal tears down and re-assembles quite easily. These paints are supposed to be notorious for clogging and fowling airbrushes. I found that the Patriot handled these quite well thinned with iso (about the same ratio as the Tamiya) as the thinner and really never had a problem unless I did not thin enough. Again coverage was really good and used less paint that I imagined I would. MM Clear never usually presents issues for me but Future seems to give the VL some problems. Never had an issue with the Patriot while shooting either of these. In fact, I was surprised that I did not have to repeatedly flush the brush and/or strip and clean it after the Future. I have not yet shot Model Master and/or Vallejo paint through it yet, but maybe in time. I have noticed that if you are switching mediums you need to extract the needle, clean it, and replace it frequently. As an example, I was shooting Vallejo Primer, cleaned the brush, ran some water through it and was ready to go for the next round of regular paint, Tamiya acrylic, and had some issue. What I found was that the Vallejo Primer is VERY thick and needs to be flushed well and probably with acetone at least once then repeatedly with water and Iso Alcohol, before switching to acrylic. If this precaution is not taken some trigger sticking, and splatter may occur, trust me on this. . . . it is best to extract the needle and clean it well before starting again (I cannot stress this enough). Also, the groove that the needle rests in if you are looking straight down from the top of the color cup, needs to be cleaned well every so often as paint WILL build up in here over a short period of time. I also found that the nozzles and the needle housing areas can become lined with paint and should be cleaned after about 4 or 5 uses to avoid build up. The needle nozzle is difficult to clean and took me several tries in the sonic cleaner in order to be able to break up the paint. Part of this is that I had not done it yet and had been shooting a lot of paint through it and several different types as well. So this may have caused the excess build up. Cleaning the needle nozzle should be done on a regular basis to avoid this issue. A good stiff bristle old tooth brush can help here as well, but remember this is a delicate part and care MUST be taken with cleaning so as to avoid damage. When I ran some test shots for pictures I used Tamiya Acrylic X18 Semi Gloss Black thinned with Windex. I ran it through several PSI settings to see which worked best. Although the brush did clog a bit I think it was more due to needing another good cleaning and not thinning the paint enough initially than any issues with the brush itself. Having said that it was VERY cold in my work area and my hands were shaking a bit. Even so, I was able to get some nice lines and patterns. The splatter was from thinning the paint with more Windex (even the Windex had issues it was so cold). While I have seen the brush produce thinner, finer and straighter lines, I could not get them on that day, but I have done some really tight detail work with Tamiya at about 12 to 18psi. Again in the right hands this brush can do some great work. Generally this brush performs above and beyond all of my expectations and has honestly changed my mind about Badger brushes in general. I would go out and buy more of these as I know it would be a solid investment in a tool that is both sturdy and precise. After getting used to the feel of the brush and knowing its quirks I found that I could hit some nice fine lines without too much effort. The control on this brush is really marvelous, control of my hand and fingers, not so much. . . .I am sure that in the hands of someone who has some real talent this brush could do some really marvelous things. In my hands it can accomplish what I need it to do, as long as I am mindful of keeping it clean. I have tried to put this brush through its paces as I felt that it was my “duty” to make sure that I covered all the bases to the best of my ability and really provide a really good review. While it has taken me a while to accomplish this I feel that I have seen what this brush can and cannot do, which is very little of the latter. The brush has taken just about every medium that I have thrown at it and handled it well. The only issues have been keeping the brush clean and free from residue ( my issue not the brushes). It has been great for overall coverage, which I do a lot of (this is why I LOVE Israeli armor). It has been great for the little camouflage I have done, and really has made it easier for me to learn this and become more confident at trying some. It has handled small detail items very well and when my hands are not shaking from the cold, it can hold a very fine line and or pattern. So, for all of my prejudices for over 20 yrs about how I thought Badger brushes were, I was very, very wrong. This brush has performed admirably even when it is not fully clean and free from paint residue. 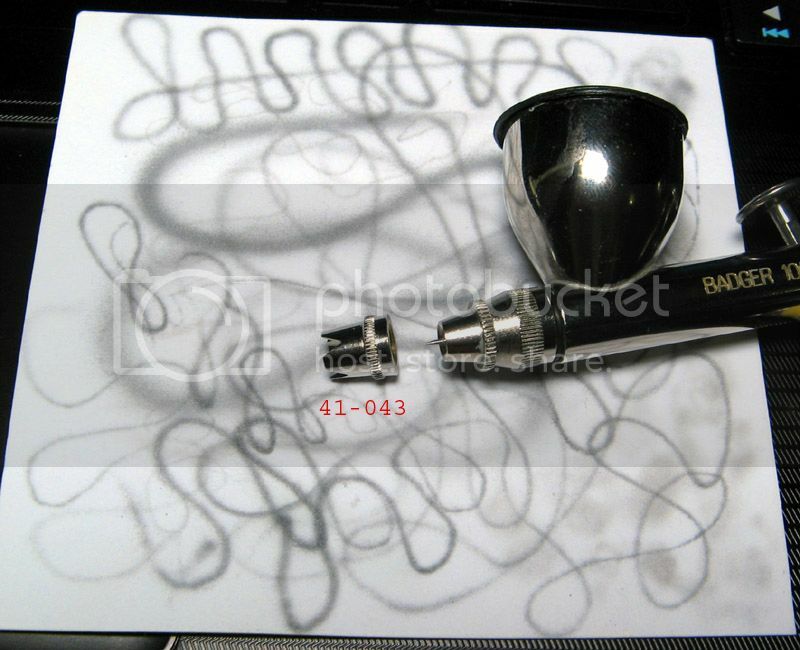 I can honestly, without any hesitation, this is a great solid airbrush that can be a workhorse for any one. Solid design with some really nice features. The quick access to the needle is great for changing mediums as you can extract this quickly, clean it and replace it in under 3 minutes if you are confident. The overall layout of parts is smart and the whole thing disassembles and reassembles quickly for cleaning and maintenance. The color cup is large and can hold a nice volume of liquid. The color cup comes with a plastic cap to avoid spills. This brush has a nice price point that is great for both beginners and seasoned veterans. Chromed exterior is great for clean up to make your brush look shiny and new again, with little effort. The needle is exposed at the front which could easily be damaged if you are not a careful person (like yours truly), a simple crown like the Iwata CMC would be a welcome addition. The needle groove in the color cup can easily become clogged with paint and care must be taken to clean it. The nozzle is difficult to clean and needs to be thoroughly cleaned after each session, so that pigments do not build up and cause flow issues. Over all I would give the Badger Patriot a 90% rating. It is a solid brush that can do both large coverage and some good fine detail too. The only issues are the minor ones mentioned above and while it takes a few points off the top it is not enough to cause you serious issues with your painting sessions. Thank you again to Armorama for the opportunity to review the Badger Patriot 105 air brush and for giving me the extra time to put this brush through its paces and do a more comprehensive write up. Cheers. Highs: Solid design, quick needle access, large color cup, nice price point. Lows: exposed needle, easily clogged needle groove in the color cup, nozzle is difficult to clean. Verdict: This is a great solid airbrush that can be a workhorse for any one. That is an excellent review, especially with the really thorough testing you did. I agree that it is a marvelous AB, since I did my review I find its really been the only brush I've used, my more expensive ones are getting dusty. Thanks for the in-depth review Damon, gave me a few laughs in the process too Has anybody tried this brush with the fine needle/nozzle combo? I am sure there are some that may find my style a bit flippant, but I think you need a few laughs or at least levity to keep people from falling asleep. Thank you for the kind words and the opportunity. cheers. Not I, we're not writing pretentious tomes here, levity and personality are good things, I think!? It's a very helpful review, what more can a reader ask for? Very nice review! I got a 105 myself too, and have been quite happy with it. Regarding the mention of the exposed needle tip, Badger does make a guarded spray regular: part# 41-043. It's originally from the 200NH brush, but they use a lot of the same components. I have no idea why they don't mention this in the 105's instructions. Just note that 41-043 is for the medium tip/needle setup. Looks like this: The trigger in the 105 been changed from the 360, which had a smaller diameter top with different texture: The old trigger is part #50-019, and there's also a rubber trigger pad, 50-087. However, to my knowledge, the old style trigger has been discontinued with a new style replacing it, using the same part number, so finding one could be a bit tricky. Never hurts to ask around, though. I don't know how they make it nowadays, but my 105 (bought a few years ago) shipped with the fine neeelde/nozzle combo. It could be that I had the 360 with its default medium needle/nozzle before getting the 105, but I didn't personally like the fine setup. Felt like I could get about as fine lines with the medium as with the fine setup, but with much less hassle. The doodling in the pic above is done with the medium setup. To me, the medium needle/nozzle is more versatile and less picky regarding paint thinning ratios and the like. Eetu; Great update and info, thank you for posting. Cheers.